Computed tomography and magnetic resonance images are reviewed to characterize all lesions for lesion size and location and to determine the number of arteries and veins; whether it is local, regional, or distant lymphadenopathy; the presence of renal vein tumor extension; and if it is a local or regional metastatic disease. Tumor size, renal vein, and inferior vena cava tumor thrombus, and lym-phadenopathy are all criteria used for staging. If the patient is a nephron-sparing surgery candidate, images are transferred to a dedicated three-dimensional imaging workstation for postprocessing, typically using real-time volume-rendering techniques (26). In the past, surface-shaded display renderings have been used for nephron-spar-ing surgical planning, but they are limited by the need for intensive image editing, which is too time consuming for most radiologists. As shown in Figures 6 and 7, volume rendering typically requires little image editing and preserves the entire dataset (3,4,26,27). 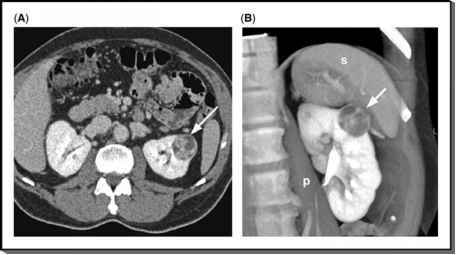 FIGURE 6 ■ Volume rendering of renal tumor before nephron-sparing surgery. (B) volume-rendered image. Volume rendering uses the entire dataset and projects a three-dimensional view of the renal tumor (arrow). The psoas muscle (p) and spleen (s) are seen and provide relational cues to interpreting the image. because of the quality of information needed for surgical planning, the radiologist typically uses a dedicated three-dimensional workstation to perform real-time three-dimensional volume rendering. ■ Although a set of static images, either digital or filmed, may also suffice, our current practice is to create one or two short MPEG-encoded (.avi) digital movie files for each case, which illustrates the critical anatomy for surgical planning. FIGURE 7 ■ Volume rendering for nephron-sparing surgery: (A) Vascular phase and (B,C) parenchymal phase computed tomography data volume renderings show a right lower pole renal tumor (arrows). With the anterior plane of the image outside the kidney, the surface of the kidney is seen, and the component of the tumor exophytic from the kidney is identified. 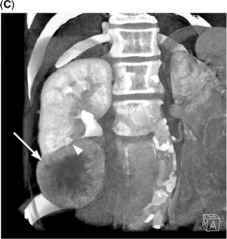 By using a "clip plane" to image inside the kidney, a large arterial branch is seen within the tumor in (A) (short arrow), and the depth of extension of the tumor into the renal hilum is seen in (B) (arrowhead). At our institution, the anatomical structures and relationships shown by three-dimensional imaging were defined in conjunction with a urologist highly experienced in performing nephron-sparing surgery. Control of the renal vasculature is necessary during nephron-sparing surgery and, therfore, the renal vessels are rendered first. This portion of the rendering shows the size, origin, and course of all renal arteries, renal veins, major segmental arterial branches, left adrenal vein, gonadal vein, and any prominent lumbar veins (Figs. 8-11). Next, using the renal parenchymal phase, renderings show the position of the kidney, tumor location, and depth of tumor extension and its relationship to the pelvocalyceal system (Fig. 12). The rendering process takes between 10 and 30 minutes, depending on the user's experience and case complexity. 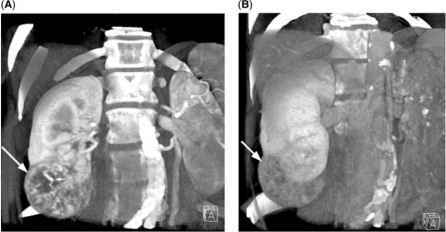 FIGURE8 ■ Conventional left renal vascular anatomy: Volume-rendered image of the left kidney during the vascular phase shows (A) single left artery (arrow) and (B) single left renal vein (arrow). FIGURE 9 ■ Anatomic left renal arterial and vein variants. An early apical polar branch is seen (black arrow) supplying the upper pole of the left kidney entering from the cortex. A retroaortic left renal vein (arrow) is also identified; retroaortic left renal veins usually cross behind the aorta several centimeters below the level of the renal artery. 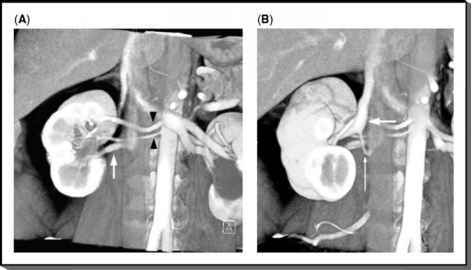 FIGURE 10 ■ Anatomic right renal arterial and vein variants. (A) Two right renal artery origins are seen (arrowhead) along with an accessory right renal vein (arrow). 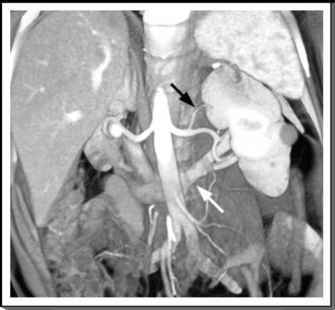 (B) The main right renal vein is seen (arrow) along with an unusual branch of the vein (long thin arrow) that results in a third renal vein entrance into the inferior vena cava. The plane in image (B) is slightly more anterior than in image (A). The enhanced images obtained during the venous phase are useful in assessing vascular invasion (Fig. 15). contrast within the arteries and suppressed signal in the rest of the image. These can then be used to produce angiographic images, such as maximum intensity projections, with minimal additional editing (28). Sequences acquired or reconstructed in the coronal or sagittal plane yield diagnostic information and help localize a lesion within the kidney.